James Corbett on, "Taking back the environmental movement"
You can start your education about this topic by thinking about a statement made on China's CCTV Dialogue program. This statement was made in the January 14, 2010 episode of Dialogue on CCTV9. Here is the archived copy of the program: http://english.cctv.com/program/e_dialogue/20100114/104844.shtml. That program was about the Haiti earthquake but, strangely, Yang Rui (the host) asked a question about global warming to Chen I-Wan, Advisor (advisor to the Chinese government), of The Commission of Natural Hazard Prediction. Fast forward to 20:30 minutes (if you can) in the video and watch it until 23:19. Below is a transcript of the question, and Chen I-Wan's answer. Yang Rui: "Do you believe the hurricanes and this 7.3 magnitude earthquake are an integral part of what we call the, "global warming"? Do you think the extreme patterns of weather conditions have all contributed to the unpredictable calamities, such as the one that took place and befell Haiti on Tuesday?" Chen I-Wan: "This relates to a related issue about global warming. Myself, and a number of experts in the committee that I work with, The Commission of Natural Hazard Prediction, as well as quite a number of experts abroad, agree with the global warming, which means the temperature during the past several years is increasing. This is a fact. However, we disagree that the main reason causing the global warming is human, mankind's activities. So I believe that, ... um ... because what we see is, there is natural cycles in the history of the earth. And especially, ... you know..., China with a very long history of, ... you know ..., several thousand years of written history, there are massive records that show that during different periods of time there are times of warming and there's also times of cold, coldness. And the warming go warmer than today and there's also times that go very cold. So, what we see is that, ... eh ... these ... eh ... what we call these extreme meteorological events are more natural cycles and natural developments." In other words, Chen I-Wan and many other scientists in China (and elsewhere) do not see any evidence that man-made carbon dioxide is causing (or significantly adding to) global warming. Therefore, if Chen is correct about mankind not causing any significant global warming, then all this talk about "low carbon" this and that is a waste of time and is fraudulent! It is an established fact that several hundred years after the world goes through a warming period, the atmospheric carbon dioxide level shows an increase, i.e., increased atmospheric carbon dioxide is a result of global warming, not a cause. The oceans release large amounts of CO2 after the climate becomes hotter and, when the climate becomes colder, the oceans absorb large amounts of CO2. Chen I-Wan agrees that average global temperatures have been increasing in "recent years" but this was in a relatively short period between about 1975 and the late 1990's – since about 1998, there has been no statistical increase in temperature and, from 1940 to 1975, there were three decades of moderate global cooling. 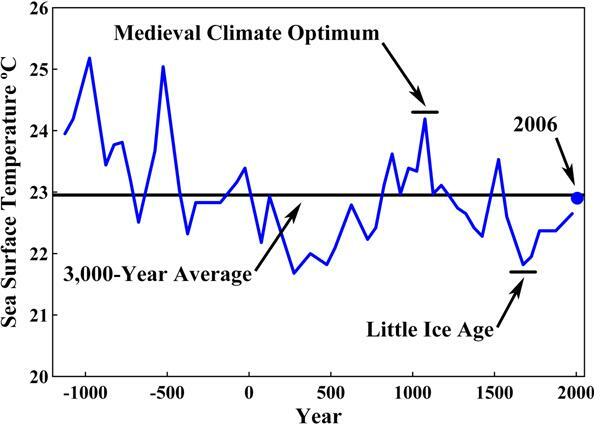 Overall, we are talking about an average temperature increase over the past 300 years of about 0.5 °C per century, during the current recovery from the "Little Ice Age", a period of relative coldness that existed from the 1500's to the 1700's. China is very concerned about air pollution, i.e., the health effects of the particulates in the air that result from burning fossil fuels. But carbon dioxide is not a particulate and is not considered to be a pollutant. "Man-made Global Warming" is also called "Anthropogenic Global Warming" or, AGW. We can see from the graphs that the world has been warming for the past 300 years at the rate of about 0.5° per 100 years. Today’s average global temperature is about equal to the average for the past 3,000 years. There does not seem to be anything unnatural or catastrophic from these temperature graphs. Even if future temperatures were to increase to those levels seen at the Medieval Climate Optimum, or shown at -500 and -1,000, this would certainly not be catastrophic for mankind. In fact, humanity prospered in those previously warm periods. Figure 3 shows that, of the past 10,500 years, 9,100 years were warmer than 2010! This is Fig. 3 above, showing the curve of best fit. The non-AGW scientists maintain that, instead of causing an increase in global temperatures, increased atmospheric CO2 is a result of increased global temperatures. Paleoclimatic data (climatic data for the past millions of years) show that these increases in CO2 levels occur about 800 years after increases in global temperature. (http://www.co2science.org/articles/V2/N8/C3.php) We are now roughly 800 years past the Medieval Climate Optimum so recent natural increases in CO2 are not surprising. The following screenshot, taken from the film, The Great Global Warming Swindle, gives an example of this approximately 800 year lag. The non-AGW scientists say that CO2 has a relatively minor Greenhouse Effect, compared to the major greenhouse gas, water vapor. Furthermore, the amount of CO2 that mankind produces is not enough to significantly influence temperature changes that happen naturally, mostly as a result of variations in the sun's activity. Many scientists estimate that even a doubling of man-made CO2 emissions would only result in a very mild temperature increase. Conversely, a drastic cut in mankind's production of CO2, at the cost of trillions of dollars, would result in only a minor, almost insignificant reduction in global average temperatures. In other words, instead of CO2 being a significant driver of temperature, the non-AGW scientists still believe in the traditional view of climatology, i.e., that the sun drives temperature and climate in general on the earth. Recent research (see Svensmark and Soon) strongly reinforces this claim. When we look at the average global temperatures over the past 120 years, we see that temperature actually fell for 35 years between 1940 and 1975, at the very time when the world was experiencing a post-war industrialization boom and mankind was producing much more CO2 than previously. This does not fit the theory that increases in CO2 lead to increases in temperature. The screenshot, below, from the film, The Great Global Warming Swindle, show this temperature drop. 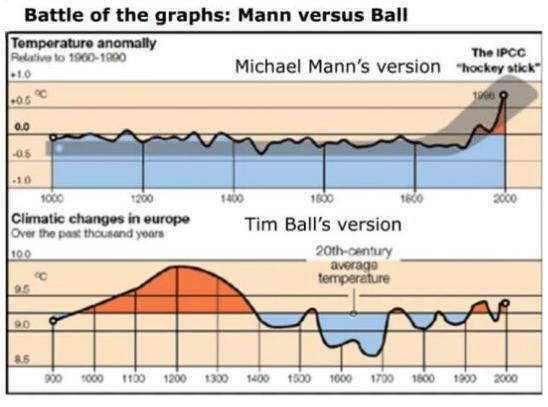 This result was the same when solar activity was compared to temperature for the past 400 years, as shown below. In other words, the sun is the overwhelming driver of temperature on earth, not CO2! The non-AGW scientists say that the raw global temperature data that the AGW scientists use (primarily the scientists at the CRU) are far from being scientifically valid samples because of, a) the fact that many thermometers in the world are placed where the temperature readings are biased, such as on airport runways and near air-conditioner exhaust vents, b) the fact that most thermometers are placed in cities where their readings are affected by the "urban heat island effect" and, c) the further skewing of this data by the elimination over the past few years of thousands of temperature collection sites that previously existed outside of urban areas. Furthermore, not only is this data originally biased, the AGW scientists have "cherry picked" (selectively chosen) what temperature data to use, rather than treating all the data in a scientifically balanced way. It is these temperature data bases that Dr. Jones of the CRU was so adamant about not sharing with other climate scientists. In fact, he deleted much of this raw data! Carbon dioxide, a natural compound that comprises about 0.04% of the atmosphere, is "food for plants". At different periods millions of years ago, the earth experienced levels of CO2 in the atmosphere that were much greater than the levels we are experiencing now, without catastrophically high temperatures. However, it does seem to be a fact that, at present, CO2 and methane levels are at levels that have not been seen for the past 400,000 years, with the CO2 level being 30% higher than the highest (estimated) levels in the past 400,000 years and methane being, until recently, 130% (!!) higher. Ice-core studies have shown that CO2 and methane levels have historically gone up and down together. But there is some good news about methane. Apparently the amount of methane in the atmosphere has "mysteriously" stabilized in the past few years and may even be decreasing. See http://ff.org/centers/csspp/library/co2weekly/20070320/20070320_04.html and https://www.scientificamerican.com/article.cfm?id=mysterious-stabilization. But, even if all these recent methane and CO2 measurements are accurate and the past estimates are also accurate, there is no evidence showing that this phenomenon will lead to significant global warming, since major changes in CO2 and methane levels have been shown to result from temperature changes, (with a lag of about 800 years), not cause temperature changes. The key point here is how much warming will result from the greenhouse effect of this elevated level of CO2. The AGW advocates (such as the CRU scientists, see below), are trying to convince us that this warming will be huge but scientists such as Richard Lindzen (see below), say that the warming resulting from the greenhouse effect of these (and future) elevated levels of CO2 and methane will be in the tenths of a degree, which is barely significant. Those scientists who maintain that man-made global warming is a fact, and will become worse, acknowledge that CO2 alone is not sufficient to produce the catastrophic global warming that they predict. The basis tenet of their theory is that a series of "positive feedback" mechanisms resulting from the temperature increase produced by CO2 will magnify this temperature increase. For example, the higher temperature from CO2 will increase evaporation from the oceans, which will produce more water vapour, which will in turn produce more rises in temperature. Their theory predicts that this will continue until a certain "tipping point" is reached, after which the warming increases exponentially and catastrophically. However, all natural systems also have "negative feedback" mechanisms, which act to cancel out the positive feedback effects and attempt to return to an equilibrium point. For examples, greater evaporation from the oceans will produce more clouds, which are known to be a major cooling mechanism of the earth (if not the major mechanism) , protecting us from the sun's radiated heat. Although the man-made global warming scientists claim that they have taken the negative feedbacks into account in their calculations, they also freely admit that virtually all of these feedback mechanisms are poorly understood, especially anything related to clouds. Therefore, their theory and their computer models are little better than speculation. Small changes in the assumptions that are made to the models could drastically alter the outcomes in either direction. These AGW scientists have arbitrarily chosen to use the story of what could possibly happen IF the positive feedbacks were much greater than the negative feedbacks and base the whole theory of man-made global warming on that. This is far from "valid scientific evidence". As Richard Lindzen says in the latter part of this interview, if natural systems behaved the way the AGW proponents claim then the earth would not have lasted as long as it has. Perhaps most significant is the fact that real-life measurements of the upper atmosphere show a complete absence of the so-called, "hot spot" that the models and the AGW theory of "positive feedbacks" assume to exist. All climatologists, no matter whether pro or anti-AGW, agree that this hot spot should exist if the "positive feedbacks" are actually taking place. But the fact that the "hot spot" has never been found therefore completely invalidates the "positive feedbacks" theory. The video called, "Climate Change in 12 Minutes - The Skeptic's Case", at https://www.youtube.com/watch?v=0gDErDwXqhc and based on the work of Dr. David Evans very succinctly shows how the anthropogenic global warming theory is not supported by any scientific evidence at all! A study of the "Climategate" emails reveals what many scientists have long suspected – that the main AGW scientists, i.e., those at the Climate Research Unit at East Anglia University in England, have produced fraudulent research results. Most of this fraud has involved manipulations of past temperature data to show cooler than actual temperatures in the past along with manipulations of more recent data to show hotter than actual temperatures, in order to exaggerate the recent temperature increase. 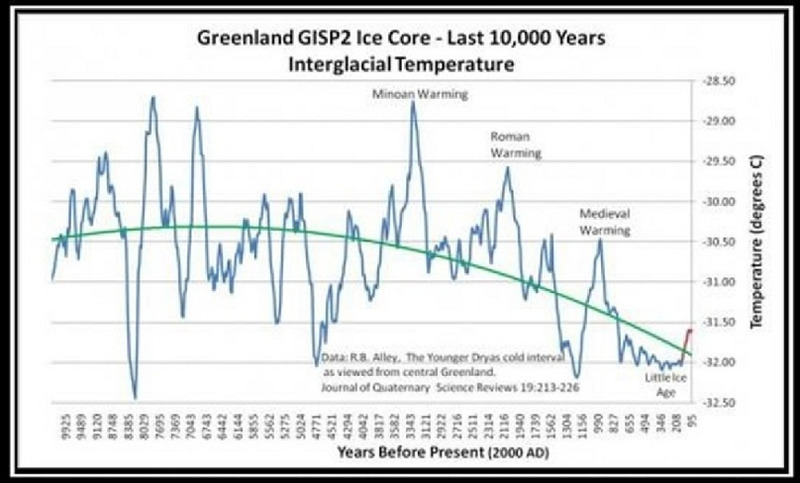 The infamous "Hockey Stick" graph was the main result of these manipulations and it was this fraudulent graph that formed the basis of the position of the United Nations IPCC reports from 2001 onwards. It is important to understand that the whole AGW theory is based on computer models of the climate system. These models, i) assume that CO2 is the main driver of temperature (not a result of temperature increases), ii) do not include the effects of the sun's magnetic field output on cloud formation, iii) do not include the cooling effects of clouds because clouds are still not well understood and, iv) do not include several of the other important factors that determine climate for example, such naturally occurring cycles as El Nino, the Pacific Decadal Oscillation, the Atlantic Multidecadal Oscillation, etc. In other words, these climate models are such poor representations of the climate system that they cannot be used as a basis for "evidence" at all. Current computer models of weather can only predict a few days into the future with any accuracy so it is ridiculous to suggest that similar models can be used to predict climate far into the future. The invalidity of the climate computer models has recently (2011-2012) been demonstrated to a level of certainly that is almost beyond doubt. See these two videos by Dr. David Evans: http://www.youtube.com/watch?v=plr-hTRQ2_c and, http://youtu.be/PSNW0LC32wU. Although we are experiencing historically high levels of atmospheric CO2 and methane, some of which is no doubt a result of human activity, the future effects of these high levels on the climate are not known. It may well be that these elevated levels of greenhouse gases will have some effect on the climate but it has not been proven that this effect will be significant enough to overcome the effects of the sun and dominate the climate! iii) There is obviously a political agenda that is driving this, accompanied by an insulting amount of scare-tactic propaganda and abusive, intolerant treatment of any alternative scientific investigation of this topic – this is not the way genuine scientific inquiry is done! vii) Very many non-AGW scientists are speaking with such strong conviction in opposition to the theory of man-made global warming. Besides, even if the earth did warm by several degrees, for example, to as hot as the Minoan Warming period of 3,400 years ago, the benefits of a warmer world, such as greater food production, would almost certainly greatly outweigh any negative effects. Mankind always prospered in these previous warm periods. In these videos, you will see many of the scientists who are mentioned elsewhere in these notes. This excellent film explains all the key points concerning the fraud. In addition to explaining how CO2 (whether produced by man or natural) cannot be responsible for global warming and explaining how the only "evidence" for AGW are faulty computer models, the film includes information on the origins of the "man-made global warming" theory and on the origins of the politicization of this theory. I suggest you watch it more than once, considering every point that is made in the film. Note that the locations of this film on the internet change from time to time, an indication of internet censorship. The most significant parts of the film are the statements of climatologists, most of whom have actually been contributors to past IPCC reports. Furthermore, their statements are more evidence that the contributing scientists to the IPCC were not all in agreement about mankind's contribution to global warming, as Prof. Seitz writes, here. 2. "Global Warming - Doomsday Called Off"
Very good film, similar to "The Great Global Warming Swindle". Also at Youtube: Part 1, Part 2, Part3, Part 4, Part 5. This is another excellent film, similar to "The Great Global Warming Swindle". In fact, some scenes from that film are included in this second film. But this second film has content that was not included in the first film. 5. "What We Are Not Being Told About The Climate"
- the sun has cyclical periods of heightened or lowered activity. When the activity is strong, the sun's magnetic field, which extends far out into the solar system, becomes stronger and deflects some of the incoming cosmic rays away from the earth so that fewer cosmic rays hit the earth. This results in less cloud formation and hence less cooling of the earth. - In this way, the sun's cyclical activities determine the heating or cooling of the earth. More and more research is indicating that clouds, resulting from cosmic rays from outer space, in combination with the sun's activity, play not only a large role in determining the earth's climate, but the dominant role. The information from this research, in combination with the Growing Consensus of an Upcoming Period of Global Cooling, which is actually starting now, gives a completely different picture to the story that man-made CO2 is causing global warming that will become become catastrophic to the planet. 7. "The Sky is Not Falling"
Video of a lecture, along with Powerpoint slides. This is an excellent Powerpoint presentation explaining the natural, cyclical global warming that occurs about every 1,500 years. Bob Carter is a professor at James Cook University, Queensland, Australia. This lecture is in four Youtube video clips. He covers much of the same material that Denis Avery covers (see 8, above.) Unfortunately, he speaks a little fast at times so it might be hard to catch everything he says. There are two versions of this video clip. Version 2 is more informative because it shows what "hide the decline" refers to. An even better explanation of "the decline" is given here: http://www.youtube.com/watch?v=PbNd-R_kCe8&feature=related. But if English is not your first language, Version 1 is useful because it shows the words to the song. The key point here is that the CRU scientists committed scientific fraud by secretly substituting one set of temperature readings (i.e. thermometer readings) for another (the inferred temperatures from tree-ring data) in order to create the graph they wanted. The significance of the "hockey stick" graph is explained at http://www.john-daly.com/hockey/hockey.htm. 11. "I Can Change Your Mind about Climate"
A copy of this film is available for viewing at http://www.dailymotion.com/video/xqhzd7_i-can-change-your-mind-about-climate_news. The first three minutes are also shown at https://www.youtube.com/watch?v=STAxhSoJvak. In addition to those two, Joanne Nova and Dr. Davis Evans made their own recording of their full, unedited 2-hour interview, parts of which were used in the ABC program. They recorded their interview with the permission of the ABC film crew. That can be seen at their webpage, http://joannenova.com.au/2012/12/full-uncut-video-now-available-i-can-change-your-mind-evans-nova-minchin-rose/ and at https://www.youtube.com/watch?v=kd6x9Q81RWk. An alternative copy (recorded by a different camera) can be seen here - https://www.youtube.com/watch?v=W2myom3cLI0. That copy is a bit clearer to listen to at times than the other copy but the audio cuts out about 3/4 of the way through the video. This 2012 video, from the Australian government-owned ABC television channel, tries to give the impression that it is presenting both sides of the "man-made global warming" debate in a balanced way. To some extend it does successfully do that so it is worth watching but I believe the film also contains several examples of serious bias or in fact, brainwashing propaganda. Certainly, some scientists are telling us that climate change is man-made, but far from all the scientists, as the words, "the world's scientists" imply. It is well-known that those many climate scientists who don't support the "man-made global warming" theory are often unpublished in the scientific literature, receive little or no publicity in the mainstream media and receive little or no research funding while those who support the theory are quite generously funded and heavily promoted by the media. There is a huge institutional bias against those scientists who question or criticize the man-made global warming theory, resulting in the impression that they don't exist. A further example of the bias in the program is the series of voices that are heard in the background as the introduction quoted above is spoken. We hear the words, "... dangerous level of carbon dioxide and it's going to increase more ...", "... used to be manageable now threatens ...", "sea ice is melting, glaciers are receding ...", and the words, "...human activity has adversely affected our climate ..." are heard in the long pause that is mentioned above. These voices in the background act as a form of hypnotic brainwashing, a way to pre-condition the viewer to favour one side of the argument before the film even begins. So much for impartiality! Another example of what I believe to be bias is the presentation of the interview with Professor Richard Lindzen. Anna Rose accused Lindzen of having previously supported the tobacco industry because he had criticized the research that was used to verify that passive smoking can cause lung cancer. In the video, Lindzen says, "I have argued as most people who have looked at it that the case for second-hand tobacco is not very good." However, in the full transcript of the interview, but not in the interview as shown in the film, he added, "That was true of the World Health Organization (which) also said that." In the transcript of the interview, but not shown in the video, he goes on to explain that he was questioning the statistical methodology that was used in this research (although some people might not understand exactly what he was saying). The full transcript of the Richard Lindzen interview is available, here. Search the page for "tobacco" to find exactly what he said. Since this attempt at vilifying the character of Lindzen is, I believe, a serious issue and an example of attacking the man rather than attacking his science, it would have been only fair to let viewers of the film see Lindzen explain himself. But this was not done; it was edited out of the interview. The result is that some viewers who are not familiar with the work of Lindzen will simply dismiss him as someone who is a paid propagandist for big corporations such as the tobacco industry and the oil and coal industries. Compare the portrayal of Lindzen in that film to his contributions to "The Great Global Warming Swindle" (#1, above) and to the many other audio, video and written examples of his statements HERE and you will then clearly see the propagandistic nature of this ABC film. The ABC website of the video does not, for some reason, clearly indicate that full transcripts of the interviews are available at http://www.abc.net.au/tv/changeyourmind/characters/. It is only when, on the main page about this video, you click on "Characters" and then click on, "Read More" that you may be surprised to discover that these transcripts exist. This is an excellent 10-minute video explaining the idea of positive and negative feedbacks and showing, in a graphical form, how the forecasts of catastrophic global warming are incorrect. It was made by a scientist or engineer so it requires some understanding of mathematics to follow the video but it should not be too hard for most well-educated people. Here we see depressed animals committing suicide as a result of global warming. Show it to your kids to help improve their mental health! You know, like your 7-year-old kid who has never thought of, or heard of the concept of suicide. More propaganda to gladden the hearts of children. A scary Greenpeace video about the cancellation of Christmas. You're going to love this video! Show it to your 6-year-old kids to "educate" them about man-made climate change! And then send a donation to Greenpeace. This video tries to explain why we have more to fear from global warming policies than from global warming itself. It points out how current predictions about global warming are exaggerated. In other words, it admits the possibility of mild global warming in the future, without discussing too much whether mankind's activities will cause this warming. Basically, the video criticizes the measures that have been advocated for lowering mankind's CO2 emissions and instead, suggests combating any changes caused by any global warming, if it occurs, by various forms of adaptation. Overall, it looks like this film was produced at the behest of the oil and especially the coal industries, but that fact should not matter if what is shown in the video is scientifically valid. This is quite an informative radio interview from Australia, interviewing Marc Moreno, founder of www.climatedepot.com. Topher Field is an Australian actor and activist. He is active in "The 50 to 1 Project", which publicizes the fact that the costs of trying to reverse the projected "man-made global warming" are fifty times greater than would be the costs of adapting to any such a climate change, were it to occur. His web page on this point is http://topher.com.au/50-to-1-video-project/ or you can go directly to the video at http://www.youtube.com/watch?feature=player_embedded&v=Zw5Lda06iK0. On Topher Field's website at http://topher.com.au/50-to-1-video-project/#prettyPhoto there are eight videos of interviews with some well-known scientists and others who have spoken out about this topic. If you are interested, there are many comments and some discussion about these interviews at http://joannenova.com.au/2013/09/tophers-501-project/. Below are the Youtube addresses of these videos but you should also read Topher Field's introduction to each video if you are not familiar with these people. Several of these people explain how they changed from being believers in man-made global warming to disbelievers. This video is a "must see" if you are a believer in man-made global warming or if you are new to this topic and undecided. She used to believe in made-made global warming because, as she says in the interview, she used to believe what the media tells us. I think she explains things particularly clearly in this interview. Joanne Nova, a scientist, is the wife of Dr. David Evans. She has a website at http://joannenova.com.au/. Anthony Watts, Investigative Journalist, former weatherman, prominent activist - http://www.youtube.com/watch?feature=player_embedded&v=RiuHOzykxC0. 18. Australian Climate Change Conflict of Interest! This is a hard-hitting political video that was made before the 2013 Australian federal election. It reveals the conflicts of interest and links between prominent politicians and important climate-related advisors to investment banks, environmental groups and the U.N. Agenda 21 movement. It was produced by the group, http://www.galileomovement.com.au/. Professor Tim Flannery was formerly the Head of the Australian Climate Commission, a federal government body. (The Commission has now been disbanded.) The following video shows him in a 2011 interview by The Guardian newspaper and website - https://www.youtube.com/watch?feature=player_detailpage&v=SeNDSeknn_c. And here is a brilliant satire of what Tim Flannery said in that interview - https://www.youtube.com/watch?v=Ts3gaehtt0g&feature=youtu.be. If you don't know about "Gaia", which this satire is based on, you can read about it here. Remember, this man is supposed to be a “scientist”. Dr William Happer speaking before the U.S. Congress. Australian journalist Andrew Bolt interviews three climate scientists. 25. The video called, "Climate Change in 12 Minutes - The Skeptic's Case", at https://www.youtube.com/watch?v=0gDErDwXqhc and based on the work of Dr. David Evans very succinctly shows how the anthropogenic global warming theory is not supported by any scientific evidence at all! If you are truly interested in whether the "proof" of "man-made global warming" is scientific fraud or not, you definitely should spend some time reading about the "Climategate" affair, including actually reading some of the released emails! People with some scientific and political sophistication can see that there is clear evidence of scientific fraud here. "Its role is to assess on a comprehensive, objective, open and transparent basis the latest scientific, technical and socio-economic literature produced worldwide relevant to the understanding of the risk of human-induced climate change, its observed and projected impacts and options for adaptation and mitigation." Notice that if any scientific research does not make it into the "latest scientific, technical and socio-economic literature", it is then excluded from assessment by the IPCC scientists when they make their report. This is a key point. If you read more about the IPCC, you’ll see that not only are they only concerned about man-made climate change, they start with the assumption that significant, measurable man-made climate change is already taking place and their purpose is to gather evidence to assess the seriousness of this man-made climate change. In other words, their purpose is not to investigate if measurable man-made climate change is taking place but to assess how much and how fast this man-made climate change is taking place. This is clearly biased and unscientific when there is no evidence that any measurable man-made climate change exists in the first place. The main group of scientists who were advising the IPCC was a small group at the Climate Research Unit (CRU) of East Anglia University, in England. This group gathered statistics from around the world and co-operated with a relatively small number of other scientists around the world (although the total number of scientists who supplied their raw data was quite large). However, many other climate scientists have long suspected that the CRU scientists were engaging in scientific fraud, especially since the CRU always refused to share their basic data with other scientists, the data from which they formed their conclusions. The law states that they must share their data if another scientist (or even a journalist) requests this. It is also good scientific practice to share raw data – the purpose of scientific research is to seek the truth, not to win some game (although data from scientific research that has commercial or military value is, understandably, often kept secret). In the case of the CRU, they had a legal and scientific responsibility to share their data because it is a publicly funded body that is supposedly doing extremely important research for the benefit of all mankind. The CRU scientists and their like-minded colleagues were distorting the peer-review process by only using each other, or like-minded scientific colleagues, to peer-review their research papers. More significantly, they were making sure (or attempting to do so) that only they peer-reviewed the papers written by scientists who opposed their findings, thereby giving them the power to ensure that those opposing papers remained unpublished in the scientific journals. As stated above in the outline of the purpose of the IPCC, any papers that are not published in the major scientific journals cannot be considered when the IPCC scientists create their periodic reports. Conclusion: It is obvious that, instead of objectively seeking scientific truth, these scientists were only focused on strengthening the case for man-made global warming, by whatever means possible, including scientific fraud, because this was, and still is, the narrow mandate of the United Nations IPCC. To repeat: If you say you believe in man-made global warming but have never actually read any of the Climategate emails, and if you have never read the types of analysis that are outlined below, then you are not being honest with yourself because you cannot have an honest belief by only considering one side of an argument such as this. Furthermore, if you naively believe what the mainstream media has said about Climategate, i.e., that it is just a storm in a teacup and not significant, then you are also not honestly investigating this topic – you should make your own judgment on whether this is insignificant or not, not rely on the opinions expressed in the mainstream media. You believers in man-made global warming cannot deny that, if the assertions written on these pages of scientific fraud are true, then surely it is indeed a serious matter for all of society! Therefore, you owe it to yourself to spend some time seriously considering what those on the other side of this argument are saying. There are several websites that discuss and analyze the Climategate emails. One of the best ones is this: http://assassinationscience.com/climategate/ by Dr. John P. Costella, a physicist. If you read his credentials, you can't deny that this man has the intellect to know scientific fraud when he sees it. Here is a copy of Dr. Costella's page, "Why Climategate is So Distressing to Scientists". This book is an expanded version of the contents on the front page of Costella's website. It also includes the above-mentioned article, "Why Climategate is So Distressing to Scientists". The following link from November 2009 is an interview with Peter Lilley, a British Member of Parliament, commenting on Climategate. Note that he is a trained physicist and therefore a suitable person to comment on questions of scientific fraud: https://www.youtube.com/watch?v=aPDyfNVUt08. See here for transcript of this interview. "I tried to write this post in a manner that transcends politics. I really haven’t taken much of an interest in the whole global warming debate and don’t really have a strong opinion on the matter. However, being part of the Science Community (I have a degree in Physics) and having done scientific research myself makes me very worried when arrogant jerks who call themselves “scientists” work outside of ethics and ignore the truth to fit their pre-conceived notions of the world. That is not science, that is religion with math equations." "CRU's evidence is now irrevocably tainted. As such, all assumptions based on that evidence must now be reevaluated and readjudicated. And all policy based on those counterfeit assumptions must also be reexamined." These articles are from December 2009 or early 2010.
http://rt.com/news/alex-jones-climate-hacker/ Another interview of Alex Jones in which he talks about banks being behind the fraud. Dr. Tim Ball comments on the Climategate email release. Included in these recordings, Tim Ball talks about the politics of the IPCC and how the IPCC was set up. This video and transcript is dated 19 November, 2010, the one-year anniversary of the "Climategate" exposure. It is a powerful video, full of facts, including some examples of the leaked emails. I urge you to watch it. On November 22, 2011 a second batch of emails from the same time period as the first batch was released. See the following: Climategate 2.0 - More Emails Released from the CRU! (Nov. 22, 2011). There you will find information on how to download a spreadsheet of both the Climategate 1 and 2 emails in chronological order, as well as a link to a major search engine on the internet for reading any of the emails. http://www.ecowho.com/foia.php This database contains both the "Climategate 1" and "Climategate 2" emails. Note that the file, ECLAT2.doc has a trojan called "Hack.Exploit.CVE-2009-0565.a". This is in every copy of ECLAT2.doc in all the locations shown above. Make sure your computer is protected by an anti-virus program! Apparently this has not been reported outside China but my Chinese anti-virus program, 'Rising', found it. Rising did not simply 'clean' the file ECLAT2.doc - it deleted the whole file. All the other files are safe. 5) "Climate change: This is the worst scientific scandal of our generation"
This article is referring to not just the scientific fraud called "Climategate" itself but also the scandal of the "whitewash" of the official investigation into the Climategate Affair. When this article was written, shortly after the Climategate exposure, the author feared that a whitewash would occur and, as it turned out, this is exactly what did happen. 6) James Corbett on, "Taking back the environmental movement"
This speech concerns the fact that environmental activism and environmental organizations have, in the recent years or decades, moved away from a concern for real environmental problems (or even ignored these problems) in favour of an erroneous focusing on CO2 as a "pollutant" and on "man-made global warming". In other words, the environmental movement has been "usurped" by political (= financial) interests. 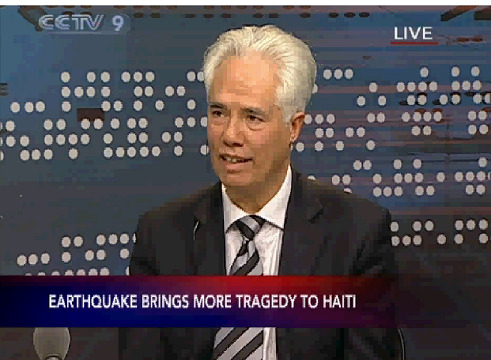 James Corbett is a political commentator who has a website at http://www.corbettreport.com. A week after the Climategate scandal was revealed in November 2009, he made an impassioned plea to environmentalists to, "take back the environmental movement" from the financiers, who have hijacked the movement and made "CO2 pollution" the main, if not the only environmental issue. In his speech, Corbett mentions some of the real environmental problems that have been sidelined by the focus on "man-made global warming", although there are other environmental problems that he doesn't mention, such as saving the native rainforests from near-complete destruction. You can see the video here: http://www.corbettreport.com/articles/20091125_enviro_message.htm. On that page, you can read the transcript of his speech as you listen to him (although he deviates from the transcript a few times). The video is on Youtube at http://www.youtube.com/watch?v=uEggt0ldQUI) You can also hear an audio recording of his speech here: http://ielts-yasi.englishlab.net/JAMES_CORBETT.mp3. James Corbett's website has many excellent articles, audio interviews and videos (shown via Youtube) on the topic of the fraud called, "man-made global warming". If you go to his website, click on the "search" button and enter any of the search words listed below, you'll find dozens of articles, interviews and videos on this topic. He also has a website, http://climategate.tv/, devoted entirely to the topic. In 1996, The United Nations IPCC (Intergovernmental Panel on Climate Change) published a report called, "The Science of Climate Change 1995". This report was based on the work of many climate scientists. However, after reading this report, the former President of the United States National Academy of Sciences, Professor Frederick Seitz, wrote a letter to the Wall Street Journal in which he wrote, " ...... But this report is not what it appears to be--it is not the version that was approved by the contributing scientists listed on the title page. In my more than 60 years as a member of the American scientific community, including service as president of both the National Academy of Sciences and the American Physical Society, I have never witnessed a more disturbing corruption of the peer-review process than the events that led to this IPCC report." "...... Few of these changes were merely cosmetic; nearly all worked to remove hints of the skepticism with which many scientists regard claims that human activities are having a major impact on climate in general and on global warming in particular. "Whatever the intent was of those who made these significant changes, their effect is to deceive policy makers and the public into believing that the scientific evidence shows human activities are causing global warming." A full copy of Seitz's letter is here. I have also made a full copy here, http://ielts-yasi.englishlab.net/SEITZ_LETTER_TO_WSJ.htm, with certain parts highlighted by me. It is noteworthy that copies of this letter are disappearing from the internet! Obviously, some people feel that this letter is damaging to the cause of promoting "man-made global warming" and it is significant these people are able to cause copies of the letter to be deleted from websites. However, copies can probably still be found in some of the "good" websites that I list at the end of Page 3. Although I have not read the 1995 IPCC report, I have read what other scientists besides Seitz have written about it (and other IPCC reports). The case of this 1995 report is quite well-known among climate scientists. The report had a summary, which, I believe, summarized the recommendations and opinions mentioned above, rather than being a full copy of all those recommendations and opinions. I believe it is this summary that Seitz claimed was changed (and distorted) after the contributing scientists had agreed on the wording of the summary. Possibly the original recommendations and opinions still existed deep in the report, where policy makers would be unlikely to read them. But if any of those recommendations and opinions were completely deleted from the report, as Seitz claimed, then that is a serious case of a politically-based corruption of science. The key point concerning this 1995 report is that several of the IPCC scientists wrote that, based on the research papers, man-made global warming was far from proven or even far from likely, but the summary of the report implied the opposite, i.e., that the research seemed to indicate that man-made global warming was highly likely to be true. It is important to understand that policy makers (government officials) around the world who receive these reports are usually not scientists so they don't fully study the complete reports – they usually base their decision-making only on the summaries of the reports, which are supposed to represent policy advice from the IPCC. In fact, many governments have agreed (like a legal agreement) to accept the advice from the IPCC. Hal Lewis is a well known American physicist and professor. The link below shows a copy of his resignation letter, sent October 6, 2010 to the American Physical Society (APS), which he has been a member of since 1943. "It is of course, the global warming scam, with the (literally) trillions of dollars driving it, that has corrupted so many scientists, and has carried APS before it like a rogue wave. It is the greatest and most successful pseudoscientific fraud I have seen in my long life as a physicist." In case that copy also disappears, I have reproduced that page, here. Ivar Giaever, a 1973 Nobel laureate in physics, resigned this month as a fellow of the American Physical Society (APS) to protest the organization’s official position that evidence of manmade climate change is “incontrovertible’’ and cause for alarm. In an e-mail explaining his resignation, Giaever challenged the view that any scientific assertion is so sacred that it cannot be contested. This article is dated 20 December 2009, just after both the Copenhagen climate conference and the "Climategate" scandal. The author explains some aspects of the politics behind this fraud. 11) A Petition signed by more than 30,000 scientists in the U.S.A. alone (i.e., not including international scientists) opposing the theory of "man-made global warming"
Especially important on that website is the page called, Summary of Peer-Reviewed Research. In addition to agreeing to the actual words of the petition, the signers of the petition are expected to have read this paper, which can be viewed here - HTML version of the article. At least two of NASA's astronauts who were involved with the "first landing of a man on the moon", Award-Winning NASA Astronaut/Geologist Jack Schmitt and Award-Winning NASA Astronaut Dr. Buzz Aldrin have declared that they reject Al Gore's theory of man-made global warming. "In an unprecedented slap at NASA’s endorsement of global warming science, nearly 50 former astronauts and scientists--including the ex-boss of the Johnson Space Center--claim the agency is on the wrong side of science and must change course or ruin the reputation of the world’s top space agency." Continue reading at http://washingtonexaminer.com/politics/washington-secrets/2012/04/astronauts-condemn-nasa's-global-warming-endorsement/469366 or see screenshot. Dr. Willie Soon is one of the leading experts on climate change. He is an astrophysicist and a solar and climate scientist at the Harvard-Smithsonian Center for Astrophysics. The key point of Dr. Soon's talk is that no correlation was found between CO2 levels and arctic surface temperatures over the past 100 years, while a strong correlation was found between solar activity and the arctic temperatures. The screenshot below, from the film, The Great Global Warming Swindle, illustrates what Willie Soon says in the video. See here for a transcript of this video. See here and here for audio copies of that video. Richard Lindzen is one of the leading climate scientists (among many other climate scientists and tens of thousands of scientists in general) who oppose the idea of "man-made global warming". I recommend any website article written by him or any video that features him. However, for many people, the degree of scientific sophistication needed to read and understand his points is sometimes a bit advanced, usually because he is addressing other scientists. But what he says in normal, "layman's terms" is well worth reading or listening to. In a 2009 editorial in the Wall Street Journal, Lindzen points out that the earth was just emerging from the "Little Ice Age" in the 19th century and concludes that it is "not surprising" to see warming after that. He goes on to state that the IPCC claims were "based on the weak argument that the current models used by the IPCC couldn't reproduce the warming from about 1978 to 1998 without some forcing, and that the only forcing that they could think of was man. Even this argument assumes that these models adequately deal with natural internal variability—that is, such naturally occurring cycles as El Nino, the Pacific Decadal Oscillation, the Atlantic Multidecadal Oscillation, etc. ... Yet articles from major modeling centers acknowledged that the failure of these models to anticipate the absence of warming for the past dozen years was due to the failure of these models to account for this natural internal variability. Thus even the basis for the weak IPCC argument for anthropogenic climate change was shown to be false." Interview, November 22, 2010: James Corbett interviews Richard Lindzen http://www.youtube.com/watch?v=uu9fprxnkEI&feature=related or here, http://ielts-yasi.englishlab.net/Nov_22_2010_LINDZEN_INTERVIEW.mp3 See here for the transcript of this interview. Dr. Tim Ball is a former climatology professor at the University of Winnipeg, Canada. He has been an outspoken opponent of the "man-made global warming" for decades and you can find many articles, videos and audio recordings of him on the internet. In the James Corbett interview shown below, he discusses some of the main scientific flaws in the theory of anthropogenic global warming and the political agenda behind it. See also the audio files of interviews with Dr, Ball about Climategate, above. This (downloadable) audio recording is an excellent introduction to this topic. However, if you are really new to this topic, you will hear references to a lot of things that you probably don't know much about. This will show you how complex this whole topic is but hopefully it won't leave you confused and lost. It is a 2013 interview of Dr. Tim Ball, a retired professor of climatology in Canada. He is a good talker (a good story teller), very easy to listen to, and very good at explaining things in terms that a non-scientist can understand. He talks about many different things related of the topic of climate change, including the fraudulent science, the persecution of scientists who question the man-made global warming theory, the United Nations I.P.C.C., and other political aspects of this fraud. He certainly knows the details, both scientific and political, of this topic. There was a second interview of Tim Ball on Oct 4, 2013. However, most of this second interview is a discussion of the political philosophy of the Club of Rome, the main political group behind the man-made global warming movement and the current global governance movement, a philosophy that is similar to the old theories of Malthus. The fact that the Club of Rome is behind all this is not even debated here until half way through the interview when Tim Ball is asked if it is true – it's assumed that people familiar with this topic know who is behind it. However, I disagree with their description of the global governance plan of the Club of Rome as "collectivist" and "Marxist". It's fascist, not socialist – both are "collectivist" but each of these "isms" is a mortal enemy of the other. For example, Hitler's Nazi Party and Soviet Communism were mortal enemies. Socialism is precisely the "ism" that the Club of Rome wants to eliminate, worldwide! Who do you think is behind the current worldwide push for the privatization of state-owned assets and services? Santa Claus? Tim Ball wins in Canadian court lawsuit brought by Michael Mann against him. Dr. Piers Corbyn, an astrophysicist, is the originator of a revolutionary solar weather technique of long-range forecasting and a founder of Weather Action Long Range Forecasters. His first scientific publications were on aspects of meteorology and astronomy. He also carried out astrophysics research at Queen Mary College London and published work on galaxy formation and the mean matter density of the universe. From his research into the causes of weather change, he totally rejects the carbon dioxide-based theory of global warming and climate change. Piers Corbyn is another scientist who has made his voice heard on the topic of global warming fraud. You can find many videos, television interviews and articles on the internet featuring him. Below is one interview. He has also done considerable research on the upcoming global cooling, very possibly a mini Ice Age. He was interviewed by the international television channel Russia Today, concerning the 10-10 video, shown on Page 3. Ask yourself why you have never heard of this, why it wasn't on the TV you watch or in the newspapers you read. Professor Judith Curry Quits over Climate "Craziness"
Judith Curry: “The deeper reasons have to do with my growing disenchantment with universities, the academic field of climate science and scientists." 18 Apr 2015 ... Prof. Curry blasts Obama's climate lies, and his climate 'deal' with China, in a House hearing on the 15th April, 2015. See also https://www.youtube.com/watch?v=ap6YfQx9I64 - "Dr William Happer Destroys Climate Change Hysteria in 7 minutes" and, https://www.youtube.com/watch?v=2Lye5liWuZw#t=365.20848 - "Physicist William Happer Schooled The CNBC Crowd On Global Warming"
Video of Dr. Spencer - "What do we really know about global warming?" Dr. David Douglas: http://www.pas.rochester.edu/~douglass/ "The observed pattern of warming, comparing surface and atmospheric temperature trends, does not show the characteristic fingerprint associated with greenhouse warming. The inescapable conclusion is that the human contribution is not significant and that observed increases in carbon dioxide and other greenhouse gases make only a negligible contribution to climate warming." Dr. Ian Clark (geologist): "That portion of the scientific community that attributes climate warming to CO2 relies on the hypothesis that increasing CO2, which is in fact a minor greenhouse gas, triggers a much larger water vapour response to warm the atmosphere. This mechanism has never been tested scientifically beyond the mathematical models that predict extensive warming, and are confounded by the complexity of cloud formation – which has a cooling effect. ... We know that [the sun] was responsible for climate change in the past, and so is clearly going to play the lead role in present and future climate change. And interestingly... solar activity has recently begun a downward cycle." Dr. Sallie Baliunas: http://www.capitalismmagazine.com/index.php?news=1816 "The recent warming trend in the surface temperature record cannot be caused by the increase of human-made greenhouse gases in the air." Dr. Chris de Freitas: http://www.nzherald.co.nz/climate-change/news/article.cfm?c_id=26&objectid=10363795 "There is evidence of global warming. ... But warming does not confirm that carbon dioxide is causing it. Climate is always warming or cooling. There are natural variability theories of warming. To support the argument that carbon dioxide is causing it, the evidence would have to distinguish between human-caused and natural warming. This has not been done." Dr. Kiminori Itoh (UNIPCC Japanese scientist and award-winning environmental physical chemist): Calls warming fears: "Worst scientific scandal in the history" http://climaterealists.com/index.php?id=1461 "When people come to know what the truth is, they will feel deceived by science and scientists." Dr. Freeman Dyson https://www.youtube.com/watch?v=ZPXbSNZqyBs - "Top Scientist Calls Out Nuclear & Climate Change Science"
"Why our CO2 emissions do not increase Atmosphere CO2"